The Best Kept Secret When Traveling — Tours! For the average westerner my age, I’ve been many places. I was born and raised in the Toronto area and spent a lot of time traveling within Southwestern Ontario because I played baseball for a traveling team. I moved to Michigan for my bachelor’s degree and while there, I visited the Upper Peninsula, plenty of other towns in Michigan, traveled to South Carolina for an Alternative Break, traveled to Costa Rica as part of a class, and then to the Dominican Republic for pseudo-Alternative Break. After this, I moved to California (driving across the country) to start graduate school in psychology. I stopped short of the PhD I’d intended to complete and ended up traveling to New Zealand for a few months. Upon returning, I lived in British Columbia before moving to Hawaii. After Hawaii, I moved to the DC area (where I currently am). As part of school trip, I spent some time in Europe. I haven’t named all the little side trips, but suffice to say, like I said, for the average person from North America, I’ve been many places. While I’ve been many places, I don’t know that I’d say I’ve “seen” them the way that I’ve now seen Washington, DC. I’ve lived in the DC area for almost two years. I didn’t take the opportunity to see the Lincoln Memorial until I’d been living here for over a year. Of course, I’d been into DC several times, but never went to see the Memorial. Recently though, I saw DC in a new light. Why? How? I took the chance to go on a tour! I’ve been part of tour groups before, but something about this one felt different. Maybe it’s because it was something I chose and not something that was simply part of the experience. Maybe it was because the material was the US National Monuments and there’s certainly an air of mystique to them. I can’t put my finger on the whole reason, but I can tell you that most of the reason was probably because of the tour guide. If you are ever in DC, I can’t recommend enough taking the time to go on a tour with Tim and the Walk of the Town. If you check TripAdvisor, you’ll note that of all of the activities in Washington, DC, his tour is ranked 1st. And, if you click-through to see his ratings, you’ll see that he’s received 595 Excellents out of a possible 609. That’s incredible! I can tell you that it is certainly deserved. I first went on the Saturday Night Tour and loved it so much that I came back a few days later for the Waterfront Walk. We learned about so much! I’d probably have to do the tours a couple of times to really have taken in all of the information that he offers. I don’t think I’ve yet mentioned this, but this may be important for some — one of the best parts about the Walk of the Town is that it’s free. A brief aside: In the coming weeks, I intend to do a few posts on some of the things I learned while on these tours and I’m really looking forward to it. For instance, even though I just finished an MBA at George Mason University, I had no idea that — essentially — George Mason is the grandfather of the Declaration of Independence! As I said, if you’re ever in DC, I can’t recommend enough the Walk of the Town. And you can be sure that the next time I find myself in a new city, I’ll be sure to find out who the best tour guide is, so I can learn about that place. 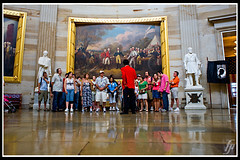 This entry was posted in Education, Entertainment, History and tagged Best Tours in DC, Costa Rica, DC Tours, Declaration of Independence, Dominican Republic, George Mason, National Monument (United States), Tour, Tour Washington DC, Tourism, Travel, TripAdvisor, us national monuments, Walk of the Town, Washington, WWII Memorial. Bookmark the permalink.